Never before seen in the Southwest, and the first of its kind in Texas, the Chinese Lantern Festival is two shows in one. 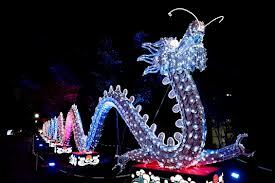 Featuring a collection of authentic Chinese art featuring pandas, flamingos, even a 110-yard-long, larger-than-life dragon made from 15,000 porcelain dishes tied together by hand, by night, the festival lights up from within to set the night sky aglow creating a completely different experience. For groups of 20 or more, please contact Wayne for rates at 214-928-7677. Prices: Monday to Wednesday $14 for Adult and $9 for Children (4-12) Thursday, Friday, Saturday & Sunday $19 for Adult and $14 for Children (4-12) FREE admission for children three or under.